Yamashita, H. (2015). Affect and the development of learner autonomy through advising. Studies in Self-Access Learning Journal, 6(1), 62-85. The inseparable relationship between affect and cognition has led us to view learners’ affect as something that learners need to be able to ‘manage’ and ‘control’. Positive affect is known to enhance learning, while negative affect can interfere with successful learning. Extensive research and theorizing led to the development of motivational and affective strategies (Dörnyei & Ushioda, 2011; Oxford, 1990, 2011). Many people hold the images of negative affect as something that is difficult to deal with, but also as something that learners should take care of by themselves. The roles of advisors in supporting learners’ affective dimensions have not been discussed extensively, and some advisors are at a lost in dealing with feelings and emotional aspects of learning (Gremmo, 1995; Tassinari & Ciekanski, 2013). In this paper, instead of viewing negative affect as something that impedes learning, I view learners’ affect, both positive and negative, as an ‘essential resource’ that advisors and learners should make use of in helping learners become autonomous and achieve their learning goals in a self-fulfilling way. Such processes are best carried out in socially-mediated dialogic interactions between the advisor and the learner. The advisor’s role is to help learners express their day-to-day feelings and motivational experiences, reflect, and engage in the cognitive-affective meaning-making process of their learning experiences. I will illustrate the effectiveness of this approach in developing learner autonomy through a case study of an EFL learner in Japan. Affect consists of emotions, feelings, moods, beliefs, attitudes, and motivation, which play an integral role in conditioning one’s behavior and learning (Arnold & Brown, 1999; Hurd, 2008; Oxford, 2011). Affect is considered to be one of the most influential factors in language learning (Dörnyei, 2001; MacIntyre & Noels, 1996; Scovel, 2000). Studies have shown that while positive affect can provide invaluable support for learning, negative affect can block processing and prevent learning from occurring altogether. For example, emotions such as fear or anxiety can interfere with the cognitive processing required to complete a task by consuming working memory resources, thereby influencing learners’ cognition, learning, and performance (Mynard & McLoughlin, 2014; Schunk, Pintrich, & Meece, 2008). Thus, in the literature, negative affect has been considered as an issue that needs to be managed and controlled so as to minimize the potentially damaging effects on learning (Ushioda, 1997). The interdependent relationship between affect and cognition has also been investigated in the field of neuroscience. Damasio (2000) states that emotions work together with cognition and that both affect and cognition are necessary for human brain functioning. Thus, learners are treated as whole persons as their emotions and cognition are inseparable (Arnold & Brown, 1999; van Lier, 1996). For learners to be successful in their language learning, managing affect is a crucial issue. This understanding has led to extensive research and theorizing on strategies that learners can use to control their motivation and engage in successful learning experiences, including motivational strategies (Dörnyei & Ushioda, 2011), affective strategies and meta-affective strategies (Oxford, 2011). Meta-affective strategies are one of the three metastrategies that self-regulated learners ideally possess according to Oxford’s (2011) Strategic Self-Regulation Model (S2R) of L2 learning. Learner autonomy is defined as one’s capacity for “detachment, critical reflection, decision-making, and independent action” by Little (1991, p. 4). Learners’ capacity to manage their affective states is on the list of characteristics possessed by autonomous learners, along with the ability to set goals, find resources, and monitor and evaluate their learning. In van Lier’s (2004) ecological/dialogical view of autonomy, he mentions the importance of looking at the person as a whole. Autonomy “means having the authorship of one’s actions, having the voice that speaks one’s words, and being emotionally connected to one’s actions and speech, within one’s community of practice” (p. 8). van Lier suggests that learner autonomy develops when learners have the authentic environment to voice their feelings and become consciously aware of their affective states in relation to their learning experiences. Applying van Lier’s (2004) definition of autonomy to our discussion, rather than treating affect as something that needs to be managed or controlled from outside, we should actively make use of learners’ affective states where the learners themselves are the main agents in their development of autonomy. In practical terms, it means that the very first step is to scaffold learners in an authentic socially-mediated environment so that learners become consciously aware of their affective states and notice the connection between their affect and cognition. Ushioda (2014) mentions that capacity for learners to self-regulate their motivation is achieved “not by progressive attempts to regulate their behavior from outside, but by supportive interpersonal processes which foster the development of autonomy and the growth and regulation of motivation from inside” (Ushioda, 2003, pp. 99-100). Dialogic interactions between a learner and an advisor are a suitable environment for such scaffolding. Vygotsky’s (1978, 1986) sociocultural theory has at its core the belief that the social-interactive process of joint problem solving leads one to internalize the strategic process and metacognitive control to solve one’s problem. The one-to-one dialogic interaction format also fosters a sense of personal agency in constructing thoughts in managing motivation and learning (McCombs, 1994; Ushioda, 2014). In this paper, I will look at on-going dialogic interactions between an advisor and a learner where the learner acts as the agent in becoming aware of her affective states and using this knowledge as a resource in making decisions about her learning, eventually leading her to succeed in learning and in developing learner autonomy. In this paper, I will present data from a case study to show the importance of addressing learners’ feelings and emotions in an advisor-learner dialogue and how it contributes to learners’ development of learner autonomy. Research until now on learners’ affective states and their relation to language learning/development of metacognitive awareness has mostly employed quantitative methods through the administration of questionnaires on strategy use or levels of anxiety related to language learning (MacIntyre & Noels, 1996; Vandergrift, 2005). While this data can provide us with general patterns on who uses what kinds of strategies, it does not provide sufficient data on how each individual processed those feelings or employed those strategies in their unique learning processes. Although a case study only provides data of one learner, it allows the researcher to probe into the one learner’s learning experience and follow the ways in which affective states, metacognition, and autonomy relate to each other, and is an appropriate method in examining learners’ thinking processes. I would like to mention here that this study is not something that I planned to conduct in advance. Engaging in one-to-one dialogue with learners is part of my day-to-day job as a learning advisor, and as part of my professional development, I was recording sessions with permission from the learners. However, as I began to see the intricate relationship between affective states, metacognitive awareness and learner autonomy, I decided to compile the data and put my findings into a paper. Thus, the advisor in the study is the researcher herself. This study took place at a two-year vocational college in Japan. The advising service is open to all students in the school, and students come to see the advisor of their choice in their free time. Students choose the language they would like to talk in, either English (practicing language) or Japanese (L1) and the session usually lasts around 45 minutes to one hour. Students fill out an information form and bring it to their first session. The form asks the learners to indicate their name, student number, major, English class number, test scores, and reason for coming, and how they learned about the advising service. In addition to the above information, the session date and length, the topics of the session, and a brief summary of the advising session are entered into the advisors’ shared data base by the advisors. 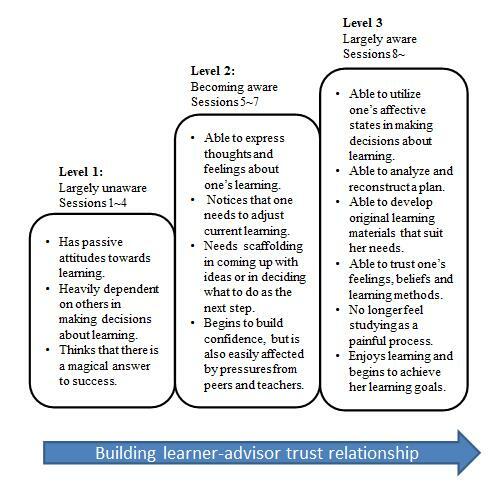 The advising process itself is a one-to-one dialogue where advisors employ advising skills (Kato & Yamashita, 2014, 2015; Yamashita & Kato, 2012) to help learners develop learner autonomy and reach their learning goals. In the academic year 2013-2014, 70% of learners came back for a second session, and within that, 20% of students came more than eight times. Tomoko (pseudonym) was one of the 101 students I had sessions with in the 2009-2010 academic year. Tomoko was selected from students who came voluntarily and regularly to advising sessions. In selecting Tomoko, I chose a learner who had not started learning English from early childhood, before the age of 11. Tomoko had been studying English for 6 years. She first started studying English as one of her required subjects when she entered junior high school, which was, at the time, the starting year of English language instruction in the Japanese education system. Exceptionally Talented Language Learners, (ETLLs), learners who innately possess high language learning abilities, were also ruled out. For example, ETLLs possess exceptionally high language memory, being able to memorize large amount of vocabulary and sentences by rote in short period of time, when non-ETLL learners have tremendous difficulty in memorizing them even with their use of memory strategies (Novoa, Fein & Obler, 1988; and Obler, 1989 cited in Takeuchi, 2008). Past studies show that learners who start learning English in early childhood, as well as ETLLs, have characteristics which may skew the data when researching about learning strategies and good language learners (Oxford, 1999; Takeuchi, 2008). In addition, in order to observe the development of a learner across a period of time, I selected a learner who came regularly for a certain length of time and for whom the advisor had recordings. Tomoko was a first year non-English major student. At the end of her two years, she hoped to work for an airline company as her dream was to become a cabin attendant, which required her to have a high TOEIC score. TOEIC (Test of English for International Communication, Educational Testing Service) is an English language test designed specifically to measure the everyday English skills of people working in an international environment. In Japan, TOEIC scores are commonly used in companies as well as vocational colleges and universities in measuring English proficiency level. For Tomoko, she needed to have certain TOEIC score to apply for her dream job, a score which was far above her current level. In her first session, Tomoko showed the characteristics of a learner with low metacognitive awareness (Sinclair, 1999), as represented by utterances such as “How much should I study?”, “How many minutes is the right amount?”, “I am using this book because my teacher said it is good,” showing dependence on others in making decisions about her learning. Tomoko came to advising sessions 29 times in her first year, and in total 50 times throughout her two years at the school. This paper explores the data of the first 24 sessions over a period of eight months. Tomoko met the same advisor (the author) throughout the two years. The individual sessions lasted about an hour, and all advising dialogues were carried out in Japanese, the L1 of both the advisor and the learner. The aim of the inquiry was to investigate the role of the learner’s affect in her development of learner autonomy. The study employed a mixed-methods approach where data was collected through multiple sources including recordings of the advising sessions, advising evaluation questionnaires, and study logs. Advising dialogues were recorded by the researcher using a digital voice recorder with the learner’s consent. The recordings were then later transcribed and translated by the researcher. Relying solely on data from recordings of advising sessions has its limitations. First, there is a possibility that learner could not/was not able to express everything that she wanted to. Secondly, knowing that the sessions are being recorded could have influenced what the learner or the advisor contributed to the session. Thirdly, since the advisor in the study was the researcher herself, it may have influenced both learner’s and advisor’s utterances. To minimize these limitations, the recorder was placed where it could not be seen by the learner. Considering the limitations of this study, including the voice recordings and the fact that the advisor is the researcher herself, the researcher triangulated the data by collecting additional data of the learner’s reflections through two types of written document; the Advising Service Questionnaire and My Study Log. The same Advising Service Questionnaire (see Appendix A) was given to the learner twice, initially after her 8th and again after her 17th session. The questionnaires included 10 Likert scale items asking about learners’ awareness on their learning and their interactions with their learning advisor. The questionnaires also contained two open-ended questions which the learner may choose to answer. The learner completed the questionnaires in an environment where the advisor was not present. The other written data, My Study Log (see Appendix B) is a form where learners record the date, duration, study content, reflection, and self-evaluation of his/her motivation, concentration, and enjoyment levels whenever the learner finished his/her self-study. The written reflections within the study logs were completed outside of the advising sessions by the learner and in an environment without the presence of the advisor. All of the study logs were collected after the learner’s 24th session, and Tomoko’s written reflections were later translated by the researcher. Here, van Lier draws our attention to look at learners’ day-to-day motivational experiences of their actual learning (cognitive) as well as their interactions with their social learning environment, including relationships with their classmates, teachers, or parents, as these factors are the key to sustaining learning. Ushioda (2014) would agree on this point as she suggests that especially when cognitive and linguistic challenges of L2 learning increase, goal-focused macro-level motivational processes are unlikely to be enough to sustain engagement in learning, and that this micro-level motivational and metacognitive engagement is the key to sustaining the L2 learning process. “The desire to learn must be awakened or re-awakened, and sustained” (van Lier, 1996, p. 91) – This statement itself implies how learners’ desire to learn is vulnerable and can fluctuate at any moment. Here, the discussion is on motivational aspects. When a learner says, “I am motivated to study English because I want to work for the United Nations, but I just don’t feel motivated to get on with my task”, it is not that learner’s motivation for working at the United Nations that is decreased. This brings up the discussion on sources of motivation. Gardner & Lambert’s (1972) integrative and instrumental motivation has been a widely accepted classification of motivation. Integrative motivation refers to a learner’s identification with the speakers of the target language, and potentially a desire to integrate with their group. Instrumental motivation refers to goals such as getting a job, promotion, or passing an exam. Since then, motivation has been often analyzed from a temporal perspective by Williams and Burden (1997), Ushioda (1998), and Dörnyei and Ottó’s (1998) process model of L2 motivation. Recently, there is more theorizing on the future temporal dimension of motivation such as represented by Dörnyei’s L2 Motivational Self System (Dörnyei, 2005, 2009) and Directed Motivational Current (Dörnyei, Muir, & Ibrahim, 2014). While setting a future-oriented motivation is important, learners do encounter and go through a number of motivational experiences in their day-to-day learning that could influence their desire to sustain their studies. For many learners, motivation related to the present is a pertinent and pressing issue. Focusing on this aspect of learners’ motivation, Csikszentmihalyi’s (1990) flow experience refers to the feeling of wanting to engage in the current learning task, or the present feeling towards the task they have completed. He stated the importance of paying attention to present or emergent sources of motivation claiming that we should not ignore the present and emergent sources of motivation:innate curiosity as well as intrinsic enjoyment, both of them essential sources of motivation (Csikszentmihalyi & Rathunde, 1993; van Lier, 1996). This concept is also referred to as ‘executive motivation’ in Dörnyei and Ottó’s (1998) process model of L2 motivation, including such factors as the quality of the learning experience, the sense of autonomy, social influences, and knowledge and use of self-regulatory strategies that influence a learner. What present sources of motivation and executive motivation imply is that when learners feel enjoyment in the task and feel they are being successful, that self-fulfilling feeling keeps learners doing what they are doing. To support this, a large body of research has shown that the way students feel about their past accomplishments, the amount of satisfaction they experience after successful task completion, and the reasons to which they attribute past successes and failures will significantly determine how they approach subsequent learning tasks (Dörnyei, 2001). Learners’ feeling (affect), thinking (cognition), and willingness toward the tasks they have engaged in contribute greatly in sustaining their desire to learn. Advisor: How do you feel about your study this week? Tomoko: Feel?… I couldn’t do it. I did homework, but no self-study. Advisor: You could do your homework, but not the self-study you planned. What feelings do you have now? Happy? Not so happy? Tomoko: [silence] I feel left out [silence] and miserable. Tomoko: I feel terrible about myself. When I go home, I just sit on the sofa and do nothing. Then I feel hungry, so I go to the fridge and get a yogurt. Then I get a text message from my friend, and I reply…and it is that lazy self that I hate. Even if I decide to study, I lose concentration within 30 minutes. Advisor: I see, so once you get home, it’s difficult to bring yourself to study and you don’t like that. How do you feel about your situation? Tomoko: I feel [silence] so terrible because I used to be able to concentrate more when I was studying for the entrance exam. I don’t know what to do. Advisor: I see, you feel terrible about yourself. After that, Tomoko was able to probe into the possible reasons for her negative feelings. Advisor: Can you tell me more? Tomoko: I am perfectionist and I cannot leave things unfinished. I cannot make compromises. I know I have to make compromises, but I worry that if I cut corners and don’t complete my work, that part that I didn’t work on might be on the next exam – and that is why I cannot cut corners and I have a habit to look around and try to do this and that. As a consequence, I end up not being able to finish everything. I wish I were able to make compromises with how much I do. I wonder how people who are good at it make compromises [emphasis added]. Advisor: What kind of feeling arose when you are cutting corners? Tomoko is describing her inner struggles. It is interesting that Tomoko used the expression “to cut corners” several times to describe situations where she did not study “perfectly” up to her standard. The advisor helped Tomoko to describe her feelings in more detail. As a result, Tomoko was able to make the connection between her feelings (guilt) and her learning experiences (cutting corners). She has a strong belief that one should do something perfectly and complete everything. In the series of sessions that followed, Tomoko mentioned guilty learning experiences: “Although I scheduled myself to do shadowing, I could not make myself get out the CD player which was only one meter away from me” (session 4). In session six, she again faced this guilty feeling, but this time, she was coming closer to finding the core cause of this issue. Tomoko: I couldn’t do what I said I would do this week. Recently I am bothered by my perfectionist character. Because I feel that I have to complete everything and do it perfectly, I cannot even start the task I planned to do. Losing my opportunity to study because I am afraid…and if I keep doing this, I won’t be able to reach my goal or dream of becoming a cabin attendant. For next week, I promise myself that I will get on task no matter how little I am able to do. Tomoko still has strong future sources of motivation to become a cabin attendant, but she has limited present sources of motivation, because the effort to start studying is immense and she cannot enjoy her learning process. Through advising dialogues, Tomoko was able to clarify the situation she was in. The next step for her was to find a way to make that ‘present’ feeling less painful. It was a big challenge for her, but she said she would try and study “something” every day for the coming week. She came back and reported in session seven that she could keep the promise to do something even though she did not finish everything she planned. The biggest surprise for her was that she felt much happier about herself. Tomoko: I was able to keep my promise! I was able to study every day! Advisor: Wow! Congratulations on being able to keep your promise and study every day! Advisor: How do you feel? Tomoko : Actually, until now, I thought that studying only 10 minutes wouldn’t have any meaning and that I wouldn’t feel I had achieved anything. But now, I feel that doing 10 minutes could actually be meaningful. I felt this time that the fact that I can engage in my self-study every day is more important for me than giving up on my study because I can only spend 10 minutes of time. I could do something every day, and this made me happier than trying to do everything and at the end of the day feeling guilty and feeling less confident not being able to do what I planned to do. So I began to think that this flexible way is a better fit for me. I also worried that I won’t be able to do well on exams if I didn’t complete my task perfectly, but I found out that that is not necessarily true. I was able to get the score [emphasis added]. This is a powerful moment where the learner is reflecting on the new approach, making a connection between her learning experience and her feelings, and realizing that she feels happier about herself in the new approach. Engaging in the cognitive-affective connection brought her to realize that the belief she held so strongly for a long time is no longer valid. Instead, her new belief about her role as a language learner emerged. Through this process, Tomoko was able to ‘re-awaken’ her desire to engage in the daily tasks of studying. As Bruner (1996, p. 49) commented, once learners come to realize that they act not directly “on the world” but on beliefs they hold about the world, they can begin to “think about their thinking” and so take control of their learning. Tomoko: I am so nervous. I want to know what my classmates are doing. I feel lost. Advisor: Right…As you said, trying not to put pressure on yourself is important for you. Remember to believe in yourself and what is good for you. Here, dialogue with an advisor expressing her feeling towards peer- and teacher-pressure helped her clarify her situation and recover confidence in the decision she had made. Tomoko was able to “sustain” her desire to learn. Advisor: What have the past two months been like? Tomoko: …Before, I was studying so hard and intensely, but I was always burnt out at the end of the day. But now, I don’t feel studying is a burden. Before, I felt satisfied, but I was also extremely tired. Now, I feel satisfied, but I don’t have that exhausted feeling. Instead, I feel a strong sense of enjoyment. Rather than talking about her improvement in an external assessment (her TOEIC score increased from 500 to 700 ) and speaking skills, her comment is on how she “feels” about her learning process, engaging in internal assessment of her progress. From the dialogical view of autonomy presented by van Lier (2004), Tomoko was able to make a connection with her feelings as she now puts value on how she feels about her learning process and refers to her feelings in making decisions about her learning. Thus, Tomoko has started to possess the characteristics of autonomy in van Lier’s sense. Next, I will examine Tomoko’s development in terms of Little’s (1991) definition of autonomy: whether the learner has shown any changes in her capacity to make informed decisions about her learning. I used Sinclair’s (1999) framework for levels of metacognitive awareness in examining Tomoko’s development. Table 1 includes both spoken and written data of Tomoko’s utterances. The spoken data was extracted from the advising dialogues and the written data was extracted from the reflect section of the study logs she kept as those are the medium in which the learner expressed her thoughts and feelings about her learning. The data show the gradual development of Tomoko’s metacognitive awareness as she engaged in more cognitive-affective meaning-making processing of her learning in advising sessions. The data from the study logs show that no reflection was written between sessions one and two although she was encouraged to write reflections by her advisor. For the following week, she kept the date and the things she worked on, but she only wrote one entry of reflection about her learning experience. Change occurred after her third advising session, around the time when she moved up the level of metacognitive awareness from Level 1 to Level 2. After that point, Tomoko began to write a reflection in her study log every time she studied. Her development of metacognitive awareness is shown through her written reflections and the data also synchronizes with her utterances in advising dialogues. For example, in her reflection between session six and seven, she used the expression “I repeatedly said to myself, it is okay that I could not spend time as I hoped to and couldn’t complete everything I wanted to do. That is acceptable,” when reflecting about the day when her study did not go as planned. This particular comment on her study reflects what she was going through at that time. It was the week when Tomoko was starting an initiative to make a compromise with her perfectionist character. She decided to study something every day even if she could not complete the whole thing. In session seven, she dismantled her previous belief that spending little time does not have meaning through the cognitive-affective meaning-making process with her advisor (discussed in previous section of this paper). As a result, when Tomoko encountered a similar situation later on, she responded with a reflection different from before. She wrote, “It [only being able to do a little work] is much better than doing nothing, because it is still moving forward!” The written reflection shows that Tomoko could now self-reflect in a positive way. This is because thinking positively is a better way for her in terms of sustaining her desire to study, rather than being caught up with her perfectionist character which often led to decrease in her desire to study further. Figure 1 is a summary of Tomoko’s metacognitive development and her attitudes and capacity as a language learner. To indicate the temporal perspective, I included approximate session numbers in which she stayed in each level of metacognitive awareness. “Approximate” because there is no clear-cut line in between. As indicated by the arrow, the learner-advisor relationship continues to develop throughout the advising period. Learners who periodically come to advising sessions tend to follow a similar timeline to that of Tomoko’s, yet the number of sessions a learner needs to move up to the next awareness level varies with each individual. This is an area that could be solidified with analysis of data on more learners as a future study. Figure 1. Tomoko’s Development of Metacognitive Awareness. Figure 1 explains changes in Tomoko’s attitudes and capacity as a learner through periodic and continuous dialogic interactions with her learning advisor, categorized by the level of metacognitive awareness (Sinclair, 1999). The results of the Advising Service Questionnaire after her 8th and 17th session (Appendix A) showed that Tomoko was satisfied with the advising service. She strongly agreed with the statements that she was able to develop a greater awareness towards her learning, found learning methods that suited her, and became more confident. All of the above data and analysis suggest that Tomoko, who came to her first advising session as a passive, other-dependent learner (Level 1) became an active autonomous learner (Level 3). She could now reflect critically on her learning processes, trust her feelings and decisions, reach out for necessary support and resources, recognize, and utilize her negative feelings effectively to establish a continuous learning system. She became more active, taking more ownership towards her learning. She came to advising sessions in total fifty times until her graduation. It does not mean that because she kept coming to see the advisor that she was dependent on the advisor. She no longer came to see the advisor asking for an answer to solve her issues like she did in her first advising session. Eventually, she made the decision as an autonomous learner and ‘chose’ to come and see her advisor because she knew that the advising dialogue is a comfortable, authentic environment where she could further reflect on her learning with her advisor, who she has built a trusting relationship with. In Tomoko’s development of autonomy, having an authentic socially-mediated environment with an advisor where she could express her feelings, and reflect on, clarify and restructure her beliefs through a cognitive-affective meaning making process was crucial. The periodic and continuous dialogic interactions with an advisor helped Tomoko become consciously aware of her present feelings and use her affective states as a resource to help her find the learning methods that sustained her desire to learn. Tomoko’s new idea for learning tasks and approaches towards her learning emerged from within her, and were not things that were imposed on her by others. She finds the cognitive-affective meaning making process to be meaningful to her, and now it is integrated into her way of being. As I have indicated in this paper, when finding the most effective and self-fulfilling ways to achieve their goals in an autonomous manner, it is important that learners learn to express both their positive and negative affective states, to connect their feelings with their learning experiences in an authentic dialogic interaction with an advisor. Since many learners are not familiar with paying attention to their own feelings and social relationships as part of the L2 learning process (Oxford, Park-Oh, Ito, & Sumrall, 1993), advisors need to make an effort to establish a professional trusting relationship with a learner (Ciekanski, 2007) so that learners feel comfortable in genuinely expressing their feelings. It is important that advisors remember that learners carry with them their various affective states, and that affect and cognition are continually integrated into everything they do. It is important that an advisor does not attempt to formulate hypotheses about learners’ internal dynamics or to try to change learners’ behaviors. Advisors are not the ones who make those cognitive-affective connections, but advisors are there to provide necessary scaffolding to facilitate those cognitive-affective meaning-making processes by carefully structuring reflective questions that stimulate learners to reflect on themselves and develop their metacognitive awareness. The process of helping learners develop their metacognitive awareness is not a simple process. Ushioda (2014) explains that it involves scaffolding which is not simply helping learners to solve a problem but rather to develop their willingness and metacognitive ability to think through the problem for themselves (pp. 42-43). Indeed, advisors need to have certain attitudes, strategies and techniques (Kato & Mynard, forthcoming; Kato & Yamashita, 2014, 2015; Yamashita & Kato, 2012) to help learners in this respect. The choice of language used in advising is important for a successful cognitive-affective meaning-making to occur. Language is part of one’s identity, and language is the vehicle of expressing oneself (Wertsch, 2007). Whether it is their L1 or their target language, it is important that learners can express their feelings sufficiently. If language used in advising is inappropriate, it can limit the depth and quality of reflection that learners are able to engage in. According to Swain & Lapkin (2005), depriving learners of the opportunity to use their mother tongue is to deny them access to a powerful cognitive resource. The use of the L1 is considered to be a psychological tool which helps students handle more cognitively complex tasks (Brooks & Donato, 1994). Thus, although I respect a learner’s choice in which language to use in advising sessions, I recommend that learners use their L1 because learners can describe their affective states in more detail. Much of the literature on motivation uses words such as interfere, stunt, and damage to describe negative affect and control, manage, and avoid when talking about supporting learners with their affective issues. Negative affect can influence one’s learning. Nevertheless, I view affect as not something that one needs to be afraid of or work with from a distance, but as an important resource that learners can use to develop a high level of metacognitive awareness and achieve their goals in a self-fulfilling way. The present study looked at learners’ ongoing motivational experiences during the day-to-day process of L2 learning. As the learner accumulated more dialogic interactions, the learner progressively became the central agent in utilizing her affective states, developing her motivational and metacognitive awareness. In the advising service questionnaire after her eighth session, Tomoko wrote, “It is my first experience being able to continue studying without feeling pain, and I am really happy about it [emphasis added].” This remark is the goal we are aiming at – to help learners attain the capacity to achieve their goals in a self-fulfilling autonomous way. For learning advisors to help learners reach this state, the first step is to help learners express their feelings, rather than avoiding dealing with them or simply introducing affective strategies and expecting the learners to manage on their own. Learners’ affect, if utilized appropriately, becomes the essential resource for the learners in their process of developing metacognitive awareness and in becoming autonomous learners. I hope that the findings and discussions I present here will contribute in furthering the discussions on firstly, viewing a learner’s affect as a resource that both learners and advisors can utilize in their development of metacognitive awareness, and secondly, in using socially-mediated authentic dialogic interactions as one of the ways to support learners in their development of metacognitive awareness and to understand how learners think through their ongoing motivational experiences in their language learning process. While I find this approach effective for language learners at the Japanese college level, more studies with learners in different contexts are necessary to make any generalizations. As I continue with my data collection, I hope that these assertions will be increasingly investigated through case studies such as the one presented in this paper. Hisako Yamashita is the Chief Learning Advisor at Kanda Institute of Foreign Languages, Japan, and the membership chair of the Japan Association of Self-Access Learning (JASAL). Her research interests include learner-advisor dialogue, affect, metacognition, advisor training, and curriculum development. She is the co-author of the English Learning Planner [Eigogakushu-techo]. Arnold, J., & Brown, H.D. (1999). In J. Arnold (Ed. ), Affect in foreign language learning. Cambridge, UK: Cambridge University Press. Csikszentmihalyi, M., & Rathunde, K. (1993). The measurement of flow in everyday life: Towards a theory of emergent motivation. In J. E. Jacobs (Ed. ), Nebraska symposium on motivation, Vol. 40: Developmental perspectives on motivation (pp. 57-98). Lincoln, NE: University of Nebraska Press. Damasio, A. R. (2000). The feeling of what happens. London, UK: Vintage. Dörnyei, Z. (2001). Teaching and researching motivation. Harlow, UK: Pearson Education Limited. Dörnyei, Z., Muir, C., & Ibrahim, Z. (2014). Directed motivational currents: Energising language learning by creating intense motivational pathways. In D. Lasagabaster, A. Doiz & J. M. Sierra (Eds. ), Motivation and foreign language learning: From theory to practice (pp. 9-29). Amsterdam, The Netherlands: John Benjamins Publishing Company. Dörnyei, Z., & Ottó, I. (1998). Motivation in action: A process model of L2 motivation. Working Papers in Applied Linguistics (Thames Valley University, London) 4, 43-69. Hurd, S. (2008). Affect and strategy use in independent language learning. In S. Hurd & T. Lewis (Eds. ), Language learning strategies in independent settings (pp. 218-236). Bristol, UK: Multilingual Matters. Kato, S., & Mynard, J. (forthcoming) Reflective dialogue: Advising in language learning. New York, NY: Routledge. Kato, S., & Yamashita, H. (2014, Spring). Basic knowledge and skills for advising in language learning: Fostering autonomy through dialogue. Special course of MATESOL program. Workshop conducted at the Graduate School of Kanda University of International Studies, Tokyo. Kato, S., & Yamashita, H. (2015). Gakushusha no jiritsusei wo hikidasu gakushuadobaijingu no kisochishiki to kihonsukiru [Fostering autonomy through advising in language learning: Basic knowledge and skills]. Manuscript in preparation. McCombs, B. (1994). Strategies for assessing and enhancing motivation: Keys to promoting self-regulated learning and performance. In H. F. O’Neil, & M. Drillings (Eds. ), Motivation: Theory and research (pp. 49-69). Hillsdale, NJ: Lawrence Erlbaum Associates. Oxford, R. L. (1990). Language learning strategies: What every teacher should know. Englewood Cliffs, NJ: Newbury House. Oxford, R. L. (1999). The strategy inventory for language learning: Theoretical context, research and concerns. Paper presented at the symposium on strategy research in AILA ’99 (the 12th World Congress of Applied Linguistics), Tokyo, Japan. Oxford, R. L., Park-Oh, Y., Ito, S., & Sumrall, M. (1993). 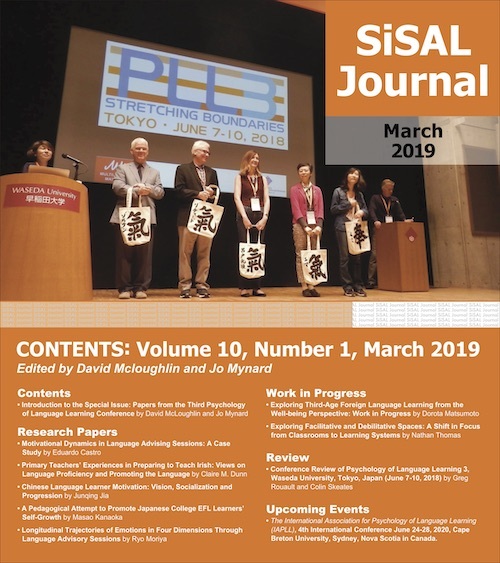 Japanese by satellite: Effects of motivation, language learning styles and strategies, gender, course level, and previous language learning experiences on Japanese language achievement. Foreign Language Annals, 26, 359-371. Schunk, D. H., Pintrich, P. R., & Meece, J. L. (2008). Motivation in education: Theory, research, and applications (3rd ed.). Upper Saddle River, NH: Merrill/Prentice Hall. Scovel, T. (2000). Learning new languages: A guide to second language acquisition. Boston, MA: Heinle & Heinle. Sinclair, B. (1999). More than an act of faith? Evaluating learner autonomy. In C. Kennedy (Ed. ), Innovation and best practice in British ELT (pp. 96-107). Harlow, UK: Addison Wesley Longman. Stevick, E. (1980). Teaching languages. A way and ways. Rowley, MA: Newbury House. Takeuchi, O. (2008). Yoriyoi gaikokugogakushuho wo motomete [In finding better ways to learn foreign languages]. Tokyo, Japan: Shohakusha. Ushioda, E. (1997). The role of motivational thinking in autonomous language learning. In D. Little & B. Voss (Eds. ), Language centres: Planning for the new millennium (pp. 39-50). Plymouth, UK: CERCLES, Centre for Modern Languages, University of Plymouth. Ushioda, E. (1998). Effective motivational thinking: A cognitive theoretical approach to the study of language learning motivation. In E. A. Soler & V. C. Espurz (Eds. ), Current issues in English language methodology (pp. 77-89). Castelló de la Plana, Spain: Universitat Jaume I.
Ushioda, E. (2003). Motivation as a socially mediated process. In D. Little, J. Ridley, & E. Ushioda (Eds. ), Learner autonomy in the foreign language classroom: Teacher, learner, curriculum and assessment (pp. 90-102). Dublin, UK: Authentik. Ushioda, E. (2014). Motivation, autonomy and metacognition: Exploring their interactions. In D. Lasagabaster, A. Doiz & J. M. Sierra (Eds. ), Motivation and foreign language learning: From theory to practice (pp. 31-49). Amsterdam, NE: John Benjamins Publishing Company. van Lier, L. (1996). Interaction in the language curriculum: Awareness, autonomy, and authenticity. London, UK: Longman. van Lier, L. (2004). The ecology and semiotics of language learning: A sociocultural perspective. Boston, MA: Kluwer Academic. Wertsch, J. V. (2007). Mediation. In H. Daniels, M. Cole & J. V. Wertsch (Eds. ), The Cambridge companion to Vygotsky (pp. 178-192). Cambridge, UK: Cambridge University Press. Williams, M., & Burden, R. L. (1997) Psychology for Language Teachers. Cambridge, UK: Cambridge University Press. Yamashita, H., & Kato, S. (2012). The Wheel of Language Learning: A tool to facilitate learner awareness, reflection and action. In J. Mynard & L. Carson (Eds), Advising in language learning: Dialogue, tools and context, (pp. 164-169). Harlow, UK: Pearson. It does not mean that there is a direct relationship between coming to advising and her improvement in TOEIC score.